A limited edition Call of Duty: WW2 Loot Crate is coming in time for Christmas, but what will be in it? Loot Crate, the purveyor of the nerdiest collectible boxes around, is creating a special, limited edition Call of Duty: WW2 Loot Crate to mark the release of the vintage-flavored shooter. It will be ready in December, just in time for Santa to shove it into his sack, and will feature six items with the signature mix of clothing, collectibles, and gear. The crate will cost $49.99, but promises war-themed content worth more than $90. Of course, part of the joy of a Loot Crate is that its contents are a mystery, but past boxes can give us an idea of what to expect. The new Fallout Crate series, for instance, includes an exclusive action figure, a piece of the series' signature power armor - so you can eventually build your own miniature suit - and (if you pre-order) a Nuka Nuke USB Hub that would definitely get you stopped at border security. 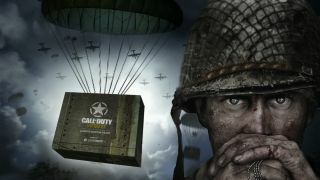 Here's some wild speculation on what could go into a Call of Duty: WW2 themed box: historically accurate ration packs containing tins of beans and mystery meat, a 1st Infantry Division badge to sew to your bowling shirt, perhaps a dartboard with Hitler's face on it. We do know Sledgehammer is working with Loot Crate to curate the box, so it should hit home for fans. "With a product of this unique caliber, we'll be able to engage with Call of Duty’s passionate fan base in new ways and offer a one-of-a-kind product and experience that takes their fandom to the next level," said Loot Crate's Chris Davis. You can pre-order the box here.